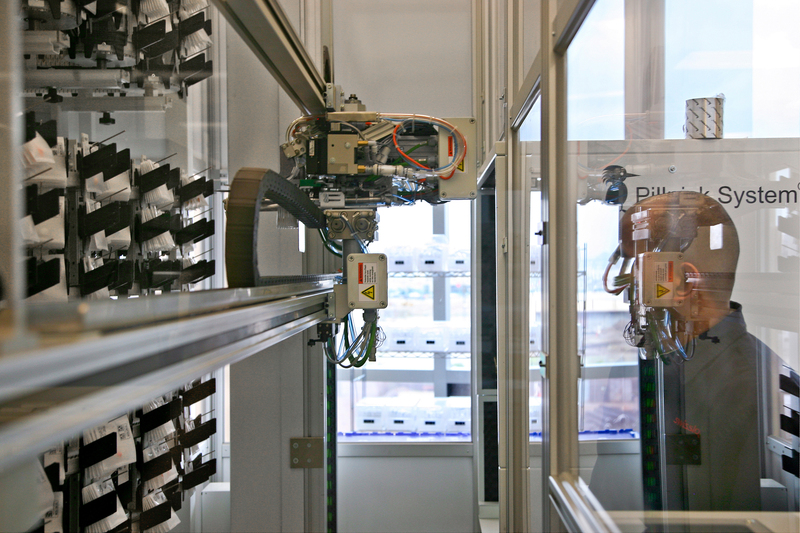 Download images from the UCSF Robotic Pharmacy for media use. Pharmacy robot selects medications from drawers. Medications selected by the pill picker drops into a drawer. Manuel Reyes, a technician with Swisslog, monitors the company's Pill Picker, part of a system of robots located at the Robotic Pharmacy at UCSF Mission Bay that precisely distributes medication to patients at UCSF Medical Center. Labeled medication packets fall out of pill picker onto rolling belt and into bucket. RIVA machine, which compounds chemotherapeutic drugs. A pharmacist works in the new robotic pharmacy at UCSF.